Puchberg is looking forward to your visit! The CLIMATIC HEALTH RESORT PUCHBERG AM SCHNEEBERG is located at the eastern edge of the Alps just 80 km south of Vienna in a romantically secluded, scenic deep circular valley. Puchberg´s major landmark is the Schneeberg, Lower Austria´s highest mountain (2,075m). Nature has been kind to Puchberg, too, which is famous for its healthy climate. 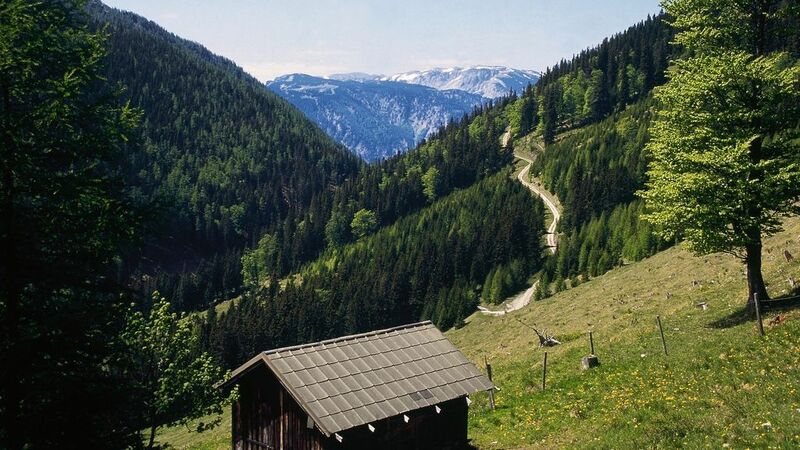 Our number one tourist attraction is the rack railroad onto the Hochschneeberg mountain. In Puchberg, you will find everything you need for the holidays of your dreams. We invite you on a discover tour through the internet to get to know our village Puchberg am Schneeberg! Everyday life is far away - enjoy the mountains. "Serene, above all surrounding mountains, no one dares to challenge him" (J.A.Schultes, 1802). The Schneebergbahn (train) - the new salamander lift, or the more than 100 year old rack railway up the Schneeberg mountain are experiences of a special kind. a white wonderland ....relax and enjoy ! The valley lies at the foot of the Schneeberg mountain, which rises into the skies, as if in deepest winter-sleep. It´s the season of winter traditions and romance in the gleam of lights around the lake. When winter comes you can stop here in the silence of the falling snow - observe the astonishing ice figures at the waterfall, mysterious tracks in the snow, glittering of snow-covered meadows in the winter sun. Advent has to be celebrated here. Take the Southern Highway A2, exit Wr. Neustadt West, take the B26 towards Puchberg. Or take the Southern Highway A2, exit. Wöllersdorf and take the B21 towards Puchberg.